The Color Guard is an historically correct Ceremonial and Living History Group whose purpose is to teach the American People the history and ideals of the American Revolution. The Color Guard is available for Parades, Ceremonial Functions, Living History events, School Lectures and Activities. The Missouri Society Color Guard will be happy to consider your request to present the American Flag and other standards at your function. 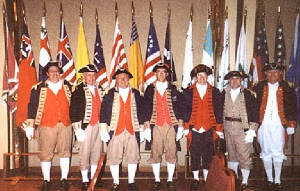 The Missouri Society Color Guard uniform is based on Lamb's New York Artillery Company. The American artillery company at Bunker Hill did not distinguish itself, the rebels losing five out of their six field guns, and two of the five artilery companies retired precipitately. Captain Lamb's company was raised in New York in July 1775 for Continental Service. It took part in the Canadian campaign where it suffered severely. Alexander Hamilton, one of Washington's aides-de-camp, was an officer in this company. The blue and buff uniform was unusual for artillery units, the majority of whom wore blue, or black, faced with red. We have 40 members, in 10 of 17 chapters, Kansas City, St. Louis, Springfield, Columbia, Warrensburg, Jefferson City, and Joplin. We are the first SAR Color Guard to carry the colors at a Major League Baseball games (in 1995, 1998, twice in 2000, 2001 and 2002), for the Kansas City Royals. The Missouri Society has appeared in over 3500+ events since 1991. National Society award winning Missouri Society Color Guard presented Colors for the first time at a 1999 Kansas City Chiefs football game before 80,000 spectators. TThe MOSSAR Society Color Guard contingency under MOSSAR Color Guard Commander, Major General Robert L. Grover (Robert L. Grover) is divided into four commands to facilitate the scheduling, and recording of activities. One is the Western half of Missouri, commanded by James L. Scott (James L. Scott); Another one is in the Southwestern part of the State commanded by Gerald McCoy (Gerald McCoy); the third covers the Central part of Missouri and is commanded by Russell DeVenney (Russell DeVenney ); The fourth covers the Eastern half of Missouri and Missouri Militia commanded by William L. Groth (William L. Groth). 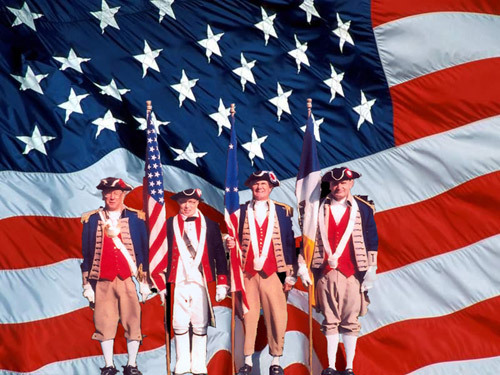 An historically correct Ceremonial and Living History Group whose purpose is to teach the American People the history and ideals of the American Revolution is available for Parades, Ceremonial Functions, Living History events, School Lectures and Activities. History of 15 colonial flags & 1777 Charleville Musket; Commander-in-Chief Guard; Impersonation of George Washington on Americanism & Patriotism; The Revolutionary Soldier 1775 -1783 & developing others. VCR 1 hr tape on Many Faces of Old Glory by Vane Scott. Wearing a revolutionary war uniform as Major General.